When: Friday, August 24, 7:30 p.m.
Tampa Bay Tech Outlook: A lot of shoes are being filled for the Titans graduating a lot of seniors from one of their best teams in school history. However, the cupboard is not bear for head coach Jayson Roberts as he still has senior RB Treshaun Ward in the fold who will be relied upon a lot this season. Ward rushed for 130 yards and two touchdowns in last week’s 54-6 drubbing of Brandon in the kickoff classic, according to the Tampa Bay Times, in a game that saw a 20-minute lightning delay. Other players to watch include RB Xavier Freeman and Jamarcus Robertson on offense while DB Jalen Thomas and DB Trevaughn Banks will be helping to anchor the defense against the 2017 Class 6A State Runner-up Armwood Hawks to help avenge a 35-12 from last season’s opener. Armwood Outlook: The Hawks, which went on a 14-game winning streak before seeing it snapped by Miami Northwestern in the Class 6A state championship game, would like to continue where the left off with last year’s game with Tampa Bay Tech with another win. However, that will happen without some of the key playmakers that were responsible for that run to Orlando by filling shoes in on both sides of the ball. According to the Tampa Bay Times, the Hawks will find their strength in the trenches this year where four of their top five linemen back in the returning lineup for this season. Several transfers also came in during the offseason that should help the Hawks along the way. 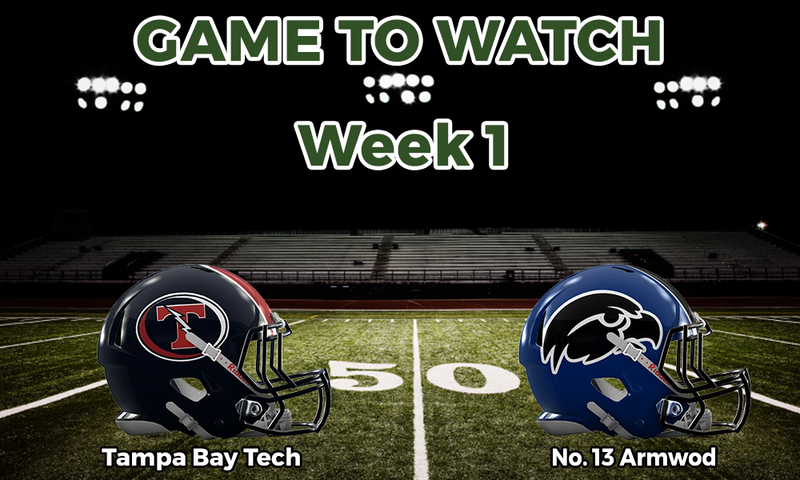 POLL: Who wins Friday night between Tampa Bay Tech and No. 13 Armwood (Seffner)?